courtesy Palm Restaurant. We had the chance to “grill” Bruce Bozzi Jr., a fourth generation family member of The Palm Restaurant, about grilling steak. Here are some of his family’s tricks of the trade for preparing the ultimate steak. Use a marinade. 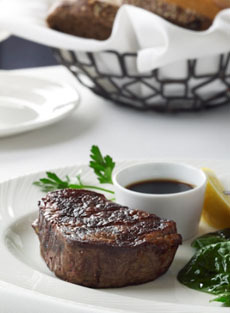 In the morning, throw the steaks into a favorite vinaigrette, barbecue sauce or other marinade and cook them at night. Hanger steak cooks very quickly, so keep an eye on it as it broils to 425º. Get it nice and charred and bring it all the way to medium. This cut is best served medium, not medium rare or well, as it tends to be a bit chewy otherwise. Place filets in a skillet over medium to medium-high heat and sear both sides for about two minutes to give them a nice color and char on the outside. Searing adds texture and flavor. Preheat oven to 400º, then turn down to 350º and roast the filets inside for 4 to 5 minutes. Use a meat thermometer and when the inside reaches 120º, the end result is a perfect, crispy-on-the-outside medium rare filet mignon. Coat the steak in your favorite olive oil. Massage the oil into the meat, then sprinkle sea salt and cracked black pepper on both sides. When it comes to cooking a New York Strip, make sure the grill or the broiler is really hot: 425ºF. Flip the steak just once, after the down-facing side is completely done. Never press down on the steak with your spatula: You press out the flavorful juices. This cut is called “rib eye” because of the rib bone attached to the meat, but it can be served either bone in or bone out. The latter is also called a Delmonico steak. The Palm and other fine beef experts recommend bone-in for maximum flavor. 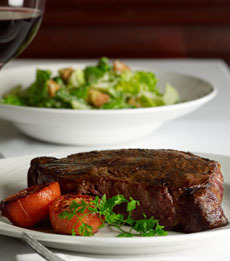 A grilled USDA prime strip steak. Photo courtesy Palm Restaurant. Once the steak is cooked, make sure to let it sit for five or more minutes before serving, to let the juices distribute. They will absorb back into the muscle tissue instead of oozing out as soon as the steak is sliced. Check out our informative Beef Glossary.